You may be looking for the town. Disney Castle is a world introduced in Kingdom Hearts. It is surrounded by Disney Town, and contains a portal to its past form, Timeless River. It is the home of King Mickey, Queen Minnie, Daisy, Donald, Goofy, and the other classic animated characters created by Walt Disney. As such, Disney Castle is considered to represent Disney's short films and cartoons, although that role would later be shared with Timeless River. Disney Castle's design is derived from the real-world Magic Kingdom, which is in turn based upon "Cinderella Castle". 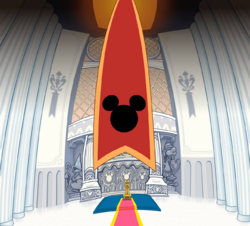 In Kingdom Hearts, Disney Castle first appeared during the opening and closing scenes. It was unplayable, although visible throughout the game on the Gummi Map screen to the left of Traverse Town. 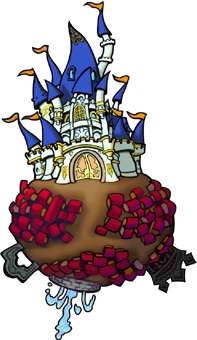 In Kingdom Hearts II, Disney Castle took on a more active role when the barrier protecting Disney Castle, the Cornerstone of Light, was corrupted by Maleficent and the world was invaded by the Heartless. This brought Disney Castle's attention to Sora and his friends, who rescued the castle with the help of Queen Minnie and the inhabitants of Timeless River. In Kingdom Hearts coded, Disney Castle appears in cutscenes. In coded, Mickey and Jiminy discover a message in Jiminy's Journal that says "We must free them from their torment" and create a data version of Sora. In Kingdom Hearts 3D: Dream Drop Distance and Kingdom Hearts III, Disney Castle also appears in cutscenes. 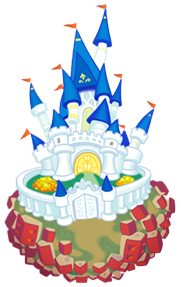 Though Disney Castle shows the palace and Disney Town on the World Map, exploration is limited to only within the castle, in almost all places that had been seen in the first game. King Mickey and Queen Minnie and other members of the royal organization hold meetings in the Audience Chamber (謁見室, Ekken-shitsu?). Hidden below Mickey's throne is another room called the Hall of the Cornerstone (礎の間, Ishizue no Ma?) where the Cornerstone of Light is kept safe. Below the castle is the Gummi Hangar (格納庫, Kakunōko?, lit. "Hangar"), a room for storing and maintaining the Gummi Ship, controlled by Chip and Dale. This room is accessed by entering a castle-like arrangement of foliage in the courtyard. Sora and his party later enter Disney Castle through this room when they visit in Kingdom Hearts II. Other places to be explored include the Library (書斎, Shosai?, lit. "Study"), where Donald, Minnie, Daisy, and Goofy first read the letter from King Mickey about the danger of the universe. Minnie, Daisy, and a broom servant can also be seen here anytime after Sora saves the castle from Maleficent after returning from Timeless River. The Courtyard (中庭, Nakaniwa?) is the place where Donald catches Goofy napping, and where Queen Minnie and Daisy ask Donald to explain things in the beginning of Kingdom Hearts. The Colonnade (廊下, Rōka?, lit. "Corridor") in the castle connects the Courtyard to the rest of the castle. The interior of the castle is used as part of the Castle Circuit racing track in the Rumble Racing competitions hosted in Disney Town. Donald Duck walks into the Audience Chamber to wish King Mickey a good morning, but is shocked to find him missing. Pluto comes out from behind Mickey's throne and gives Donald a letter from the absent King. King Mickey states in the letter that he has left to try and figure out why stars have been blinking out all over the world and he tells Donald and Goofy to find "someone with a key" and stick with him. Mickey tells them to begin their quest by going to Traverse Town and asking Leon for help. Donald and Goofy are ordered by Queen Minnie to find the "Key" and the King. Jiminy Cricket is assigned by the Queen to become their royal chronicler. As they are leaving the world, Pluto jumps on the Gummi Ship to follow them. Donald and Goofy begin their journey from here on. Following the defeat of Ansem, Huey, Dewey, and Louie return to Disney Castle after the order of the worlds is restored. When Pete and Maleficent attempt to defile the Cornerstone and try to take over the castle by going back to the past to alter the present, Sora visits the castle for the first time and he protects Queen Minnie. Eventually, he goes to Timeless River, a past version of Disney Castle before it was built, with Donald and Goofy to stop Pete from destroying the Cornerstone. 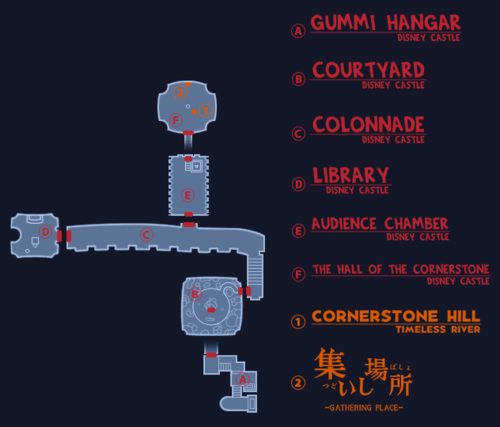 The Keyblade Graveyard, where Sora fights the Lingering Will, is also accessible via the Hall of the Cornerstone. Some time after Xemnas's defeat, Mickey, Donald, Goofy, Scrooge McDuck, Pluto, Huey, Dewey, and Louie all return to Disney Castle. Not long after returning to the castle, Jiminy Cricket re-organizes his journal and finds a mysterious message, which is later digitized by King Mickey to create a Sora out of data in hopes of discovering when the entry was added by reliving the moment. King Mickey, Donald, Goofy, Jiminy and Pete are sucked into the data world of Disney Castle. Meanwhile, in the real Disney Castle, Chip and Dale finds a way to contact them. When the data world is completely debugged and erased, they are sent back to the real Disney Castle, where King Mickey writes a letter to Sora about his findings (Terra, Aqua and Ven) and sends it to him in a bottle. Maleficent and Pete return to Disney Castle, take Minnie hostage and summon Mickey, Donald and Goofy to speak with them. Maleficent demands access to the Data Worlds once again, but Mickey refuses. As Maleficent attacks them, Lea arrives and stops her, rescuing Minnie from Pete in the process. Maleficent and Pete take their leave, while Mickey, Lea, Donald and Goofy return to the Mysterious Tower. Throughout Sora's journey, Chip and Dale contact and give him information from the Gummiphone in the library in Disney Castle. Following Master Xehanort's defeat, Mickey, Donald, and Goofy reunite with Minnie, Daisy, and Pluto at Disney Castle. After Yen Sid, Chip, and Dale arrive, the group watches fireworks high above the Castle. Because Disney Castle is not based on any Disney film, it is the only Disney-based world in the game that doesn't borrow anything from the productions. It is based plot-wise, only borrowing characters instead. In the Audience Chamber, there are statues of Donald and Goofy in full regalia, or their ancestors, and in the Library, there are two portraits of Mickey's ancestors. The Audience Chamber also contains a sculpture resembling the Kingdom Hearts logo. On the desk in the library there is a photo of King Mickey and Queen Minnie in their normal Disney clothes. Furthermore, several of the hedges in the Courtyard are patterned after the band players from The Band Concert, one of them bearing a resemblance to Horace Horsecollar. Disney Castle was shown as a playable world in an early trailer for Kingdom Hearts, but was removed from the finished game. The statue of Donald in the Audience Chamber wears a shirt similar to the one Donald wears during the "Pomp and Circumstance" segment in Fantasia 2000. The main theme of the world begins with a drum beat identical to the one used for the theme of 20th Century Fox. This page was last edited on 17 April 2019, at 05:44.